This all-terrain stroller would be a good equipment to use when you are planning to walk on uneven terrain, i.e., parks, sliding slopes, and even gravel. Your child will not be bothered much by uneven lout so it makes putting the baby in the stroller easier and levels as the stroller has good suspension so that bumps are cushioned. The canopy is wide, giving your baby the needed protection from the sun’s rays. Both baby and parent are provided with their trays to have their cups things on, a big basket to put in baby supplies. The stroller can stand alone by itself when folded so mom does not have to worry about having the stroller one the ground when not in use. The baby tray can be moved in/ out so that it does not get in the way when putting the baby in or out of the stroller. The stroller is compatible with any Graco Click Connect Car Seat (which can be purchased separately) so that mom could easily have a travel system in no time. The stroller has 2-step rear brakes which can be locked so that the stroller stays in place. It also has a front wheel locking system that makes for straighter paths if locked. Having the front wheel unlocked allows for the wheel to swivel whichever way you want the stroller to go. Although the stroller can be folded with one pull of the strap, the folding mechanism does not stay in place so that sometimes the fold slips off. The rear wheels are so big that it sometimes take on a lot of dirt when traversing muddy terrain. Care should be taken when putting a very small infant in the stroller as a 5 month old may be too nimble to be left on the stroller for a long time even if reclining. The utility bags attached, though big, must not be packed full as this might make the weight of stroller with baby a bit heavier to easily maneuver it. 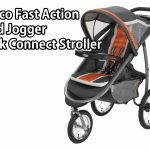 The Graco Fast Action Sport LX Stroller is a very versatile stroller which you can use for your child from infancy to toddler age (maximum of 50 pounds). Its large canopy allows use by kids who are as long as 45 inches. Thus you can enjoy longer walking days with your baby without having to worry about how you will bring him as you will enjoy moving the Graco stroller in much the same way as your child will enjoy the comfort riding this stroller. Enjoy lazing around by unlocking the front wheel so you can go where your heart wants you to ride with your baby. Or if you just want to have long straight walks, lock the front wheels so that the stroller will not swerve and just follow a straight path. Either way, you and your baby will definitely be put in a relaxed stance as you just enjoy the cool breeze while you do your walks. 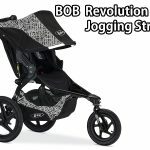 Enjoy the cool banner colors of gray with black woven fabrics, definitely giving the stroller a grand, solid look.